[Part of Montana's capital, to Spanish-speaking immigrants? (4)] is ESTE HELENA, as in east helena. [Awful place to take a vacation? (1)] is HELLISH ISLAND. i think i went there once. it sucked. [Founding father visiting Portugal's second city? (2)] is O PORTO JEFFERSON. or maybe OPORTO JEFFERSON. i know this city as porto (mostly because i know the soccer team, formerly coached by jose "the special one" mourinho), but wikipedia tells me that oporto is also sometimes used as the name of the city. well then. [Honorific for Sooners' favorite lady? (3) is MADAM OKLAHOMA. and [Games between the Cleveland Indians and the Toledo Mud Hens? 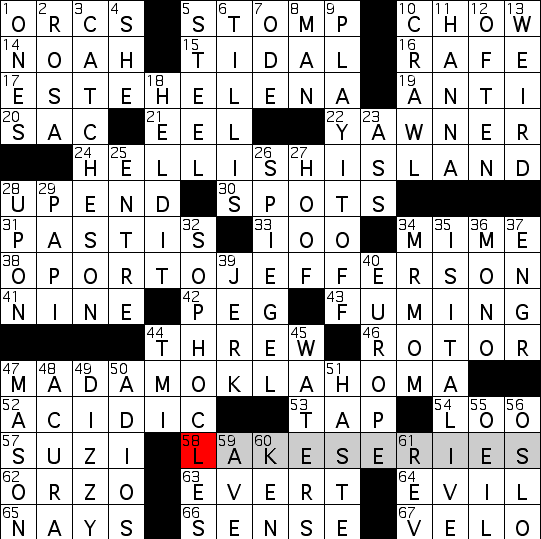 (5 -- and the theme of this puzzle)] is a LAKE SERIES. the mud hens, by the way, are a real minor league team, the AAA affiliate of the detroit tigers, in the international league. as such, they'd never play the major league indians. they do often play the buffalo bisons, long-time affiliate of the indians (but now affiliated with the mets), and i suppose that would be a LAKE SERIES too. so what's going on with this theme? well, it probably has to do with lakes (as the last clue implies). can you think of a LAKE SERIES with five members? 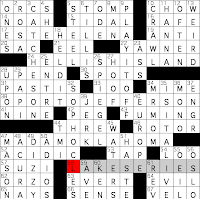 i sure can: the great lakes, including lake ERIE of crossword fame. and lookie here, LAKE ERIE is hiding in that last theme answer, except that the ERIE part has been bracketed with a pair of Ss. a similar thing has been done to a geographical place name in the other four theme answers: ST. HELENA plus Es, ELLIS ISLAND plus Hs, PORT JEFFERSON (where is that? wikipedia tells me it's a new york town of 7000 or an ohio town of 300. well then.) plus Os, and ADA, OKLAHOMA plus Ms. putting the extra letters in the indicated order gives ... HOMES, the mnemonic for the great lakes that everybody learned in elementary school. although i have to say, huron, ontario, michigan, and superior are much less useful than ERIE for crossword puzzles. PASTIS is apparently a [French aperitif]. never heard of it. somebody named TILLIS is ["Stutterin' Mel"]. never heard of him, either. not one but two gratuitous chess clues: pawn SAC and OSLO, home of world #2 magnus carlsen. ["Antigone" playwright] is SOPHOCLES. i so wanted this to be jean ANOUILH, the french playwright who had his own take on the story. i mean... his name ends with -LH. how cool is that? least favorite answer: IOO, clued as [Five score, written out]. ouch. favorite answer: HELD IT, clued as [Didn't go to the bathroom]. now there's a good use of IT in the answer, unlike ACE IT, which i see semi-regularly but don't much care for. i'm not wild about the IT in PLAY IT OFF [Act nonchalant], while we're on the subject. HOOF [___ it (walk)] is good. i think IS IT ALIVE [Sci-fi movie question] is a little iffy, but probably okay. except that it's kind of getting to be too many its, no? oh yeah, YAWNER [No barn-burner] is great, too. if this were the saturday stumper, this would have some boring clue about somebody who's yawning. okay, that's all. see you next week!